Nestled in the middle of the beautiful Lehigh River is Hugh Moore Park, a hidden island gem located in Easton, Pennsylvania. A fascinating landmark rich with history, the park was a birthplace of the United States Industrial Revolution, and thousands flock to it each year for a trip back in time. Originally built as an industrial park, the history of Hugh Moore was centered on the large amount of anthracite coal that was shipped down the Lehigh Canal from Jim Thorpe, PA. Over the years it has evolved into a scenic oasis where visitors can admire the beauty of nature and explore the many family-friendly activities centered there. There are many reasons to visit the historic Hugh Moore Park, and this Lehigh Valley treasure has something for everyone! 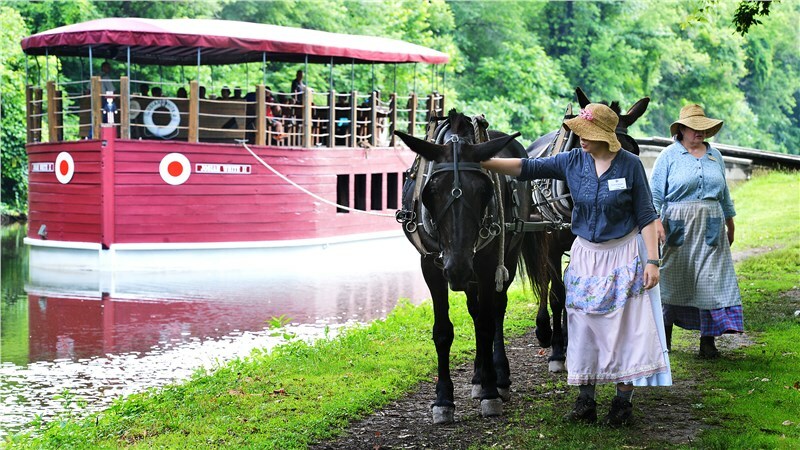 With its location on the Lehigh Canal, visitors can enjoy the Josiah White II canal boat ride – Pennsylvania’s only mule drawn canal boat cruise! This iconic 40 minute tour is guided by park personnel dressed in authentic clothing from the historical era. To delve further into the history of the region, don’t forget to visit the National Canal Museum and Locktender’s House! The museum is rich with artifacts that reflect the culture of the Easton, PA area and will take you through a historical journey of America’s canals and the Lehigh Valley canal industry. The Locktender’s house was originally constructed as close to the lock as possible so the person responsible for its operation could supervise it at all times. Located between the Lehigh River and a guard lock on the Lehigh Canal, it is an interesting attraction that embodies the spirit of the area’s history! After exploring the area of the Lehigh Valley, it is easy to see why so many people call it home! When planning your next relocation you will want an experienced Lehigh Valley moving company that can meet your family’s needs! O’Brien’s Moving & Storage is the premier Easton moving company for the Lehigh Valley area. Our exceptional staff of Lehigh Valley movers will be with you every step of the way to ensure your move goes as smoothly as possible. Give us a call today to connect with the first choice in Easton movers and get a free, no-obligation quote on making your move to the beautiful Lehigh Valley!